How much RV Solar do I need? 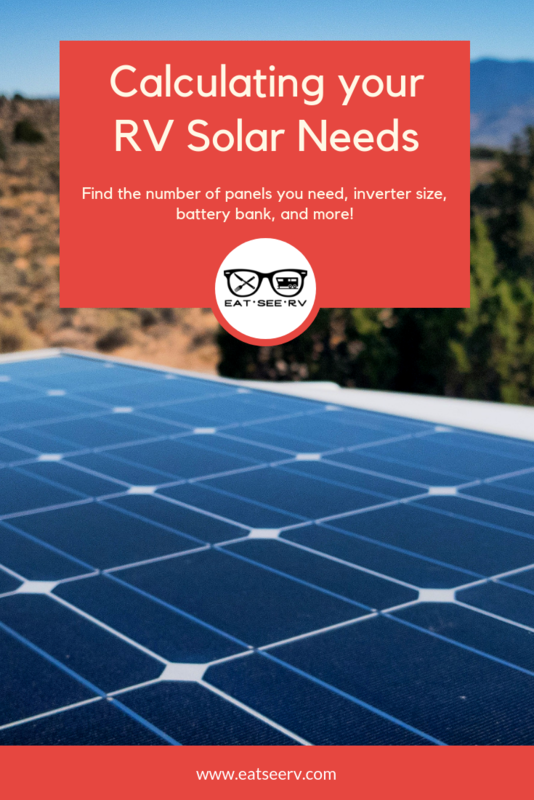 Today we’re talking how much RV solar you need! 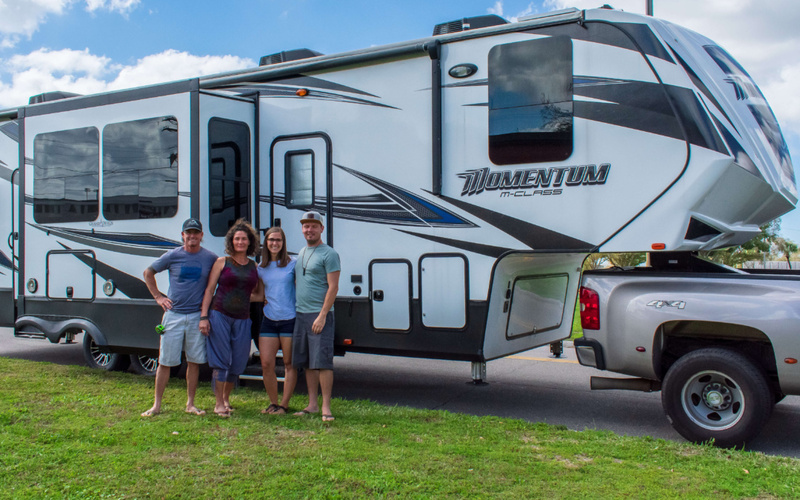 If you’re not super familiar with RV Solar, why you would want solar for your RV, how it works, or if we think it’s worth it – click here to see our previous post. 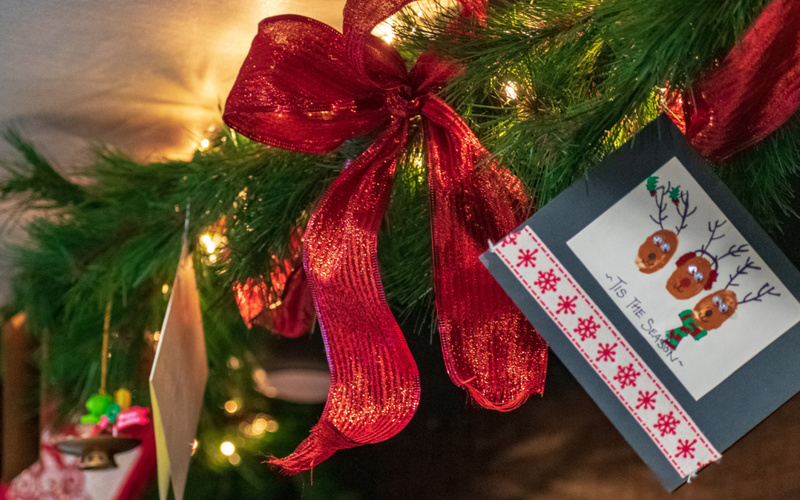 If you’re here, we’re assuming you already realize how amazing RV solar can be in providing you with freedom to park wherever you want with the creature comforts you want and expect with an RV. 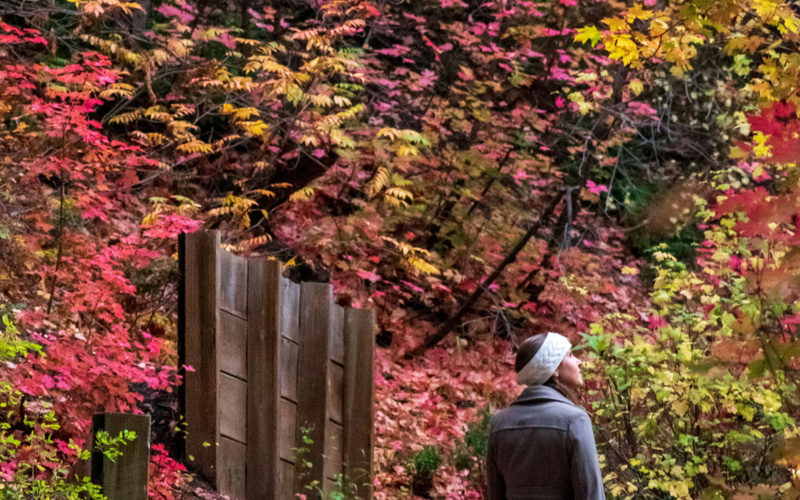 Figuring out that you want solar is only the first step. Now you have to determine what size inverter and charge controller you need in addition to how many batteries and solar panels will do the job for off grid camping on your rig. This probably isn’t a shocker, but we feel it should be said; we are not professional electricians, RV solar experts, or licensed to sell, install, or advice you on solar installations. 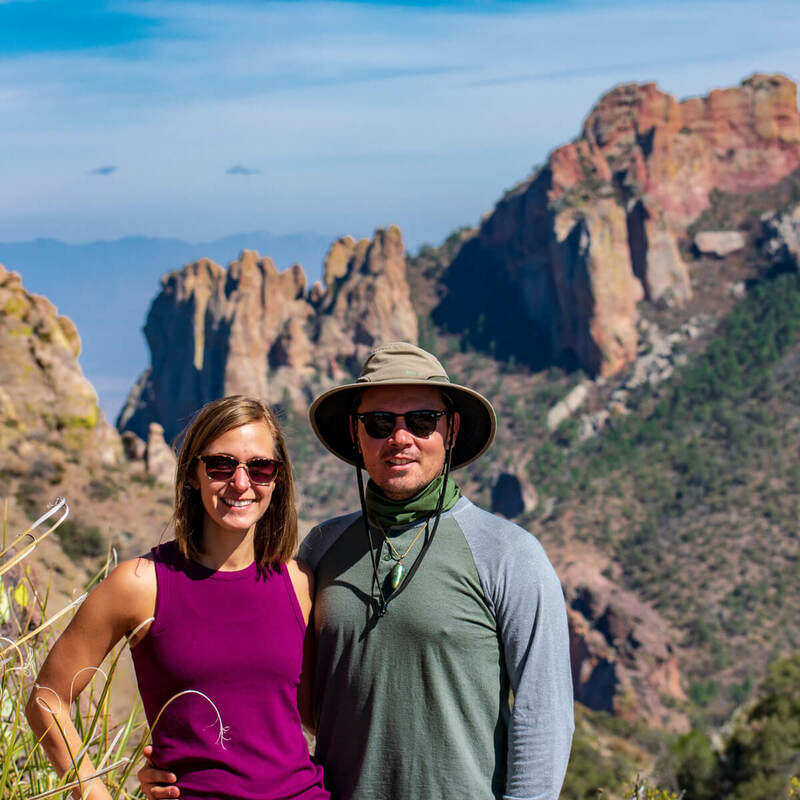 We are simply sharing our research and knowledge on the topic (which to be honest is from watching a ton of youtube videos, reading other blogs, and from our own experience of trial and error). Please verify all information with a licensed professional before installing yourself! So let’s get straight to it and figure out how much RV solar you need! Watts are a measure of power. That means how much power your appliance draws to use it (this is important to calculate the power (watts) an appliance draws from the inverter). Knowing your total average consumption in terms of wattage is the key to determining your battery bank size, inverter size, and number of solar panels needed. Start by writing down every appliance on or in your RV that you want to use with your solar set up. Write down the output wattage. It can either be on a label of the appliance, or if the label is gone or unfound, you can use a Kill A Watt EZ for to find the output wattage. Plug the Kill A Watt EZ into the outlet, plug your appliance in, operate your appliance then push up or down until you see the reading fo Watts. We feel the Kill A Watt EZ is the easiest way to find the output wattage without a lot of math. However, there are some appliances that you cannot test with the Kill A Watt EZ (like your CO2 sensor or lights), so remember to use the label for that, and the formula W = V x A if needed or milliamps / 1000 = amps. RV Example 1: Our microwave’s label said it has an output wattage of 1,000. That means it draws 1,000 watts of power to operate. RV Example 2: Our MacBook computer charger did not have the watts on the label, it only had an output voltage of 24 Volts, and 4.25 amps. So I had to use the formula, Watts = Volts x Amps (24V x 4.25a = 102 watts). Another way to test the wattage if you don’t want to do math or the label is gone, is by using the Kilowatt EZ. When I plugged my charger into the Kilowatt EZ and operated the laptop while charging, it read 100 watts. When I had my computer closed (not using it) and charged it, it read 85 watts. RV Example 3: Our CO2 sensor only said “108 milliamps, and 12V, so I had to find the amps in order to calculate the wattage. I used the formula, milliamps / 1000 = amps, to then calculate the wattage using the formula watts = amps x volts. (108 milliamps / 1000 = .108 amps, then I calculated .108 amps x 12 volts = 1.296 watts, or rounded up to 1.3 watts. Volts: Voltage is a unit of electrical potential. In laymen’s terms, volts is a measure of “push.” 12 volts is much “weaker” than 110 volts. To be able to convert the different voltage levels from a generator or batteries, you have your converter. Important Note: Most battery banks are 12-Volt or 24-Volts, meaning they “push” D/C power at a weaker rate than per say a generator, which is typically 110 Volts A/C Power. Most electrical outlets are 120 Volt and operate off A/C power, so if you use the Kilowatt EZ to read you wattage, do not use this to measure amps, as the amperage will be from 120 Volts A/C power, not 12 Volts D/C power like your battery output will be. Next, you need to calculate your actual usage on a given day. Essentially, how many watts you use on an average day. To determine this, you will need to write down the number of hours or minutes you operate that appliance on an average day and multiply that by the number of minutes you operate or hours a day it runs. Take a look at our examples below. RV example 1: Our coffee maker uses 960 watts. If we use the coffee maker for 10 minutes each morning, we would multiple 960 x .10 which equals 96 watts. RV example 2: Our WeBoost cell Booster runs 24 hours a day, so I multiply the 8 watts x 24 that gives me a total of 32 watts. Example calculation for our Amp-Hour Needs for an average day. If my actual calculation is less than 1 amp hour, that means I rounded up for good measure. But that is if we use EVERYTHING every day, which we don’t. Realistically, we need about 2,000 watts each day. Batteries typically have an amp-hour rating on them and that will vary by the type of battery you get. Amps refers to the amount of electrical current a device draws, or in other words how much electrical current an appliance draws from the batteries to run. The Amp-hours tells you how many hours you can run your appliances from your batteries. For example, if your drawing 15 amps per hour from your batteries and your batteries are rated for 225 amp-hours then you would be able to go 15 hours without recharging in one form or another (either with solar, shore power, or generator). One thing we wish we knew before full time RVing was how to take care of batteries properly. It’s really important to never let your batteries drop below 50%. If that happens (which it did for us…several times before we knew better), expect to dramatically decrease the effectiveness of the batteries (their ability to hold charge), and the overall life of the battery. All in all, you’ll have to replace them a lot sooner than you would have to if you monitored them and always kept them above 50%. 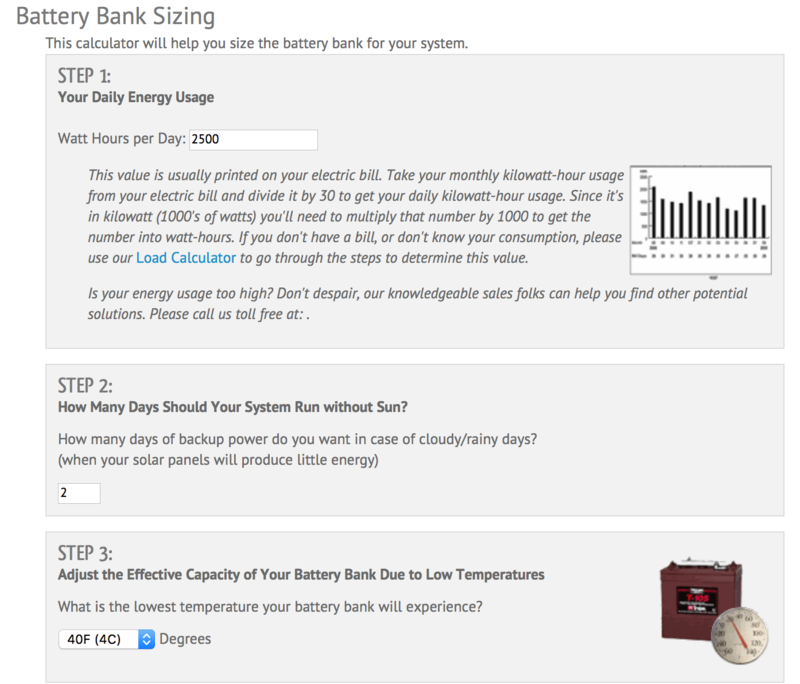 To determine the battery bank size we needed for our usage, we used the online calculator from AtlE store (https://www.altestore.com/store/calculators/off_grid_calculator/). Input the data you gathered about your average daily wattage use, how many days you’d like to run without needing to recharge, your location, controller type (either MPPT or PWM), and it will tell you the number of amp-hours your ideal battery bank would be. Our calculator said we needed nearly 1,000 amp-hours of batteries to supply our needs for 2 days without recharging. While that’s the perfect setup, we just didn’t have the space or budget for that. So instead, we have four 6-volt batteries that are combined to make two, 12 volt batteries with 225 amp-hours each. That means our total battery bank has 450 amp-hours. However, since we cannot let our battery bank drop below 50%, we really only have 225 amp-hours of usable power at any one time. If we are getting partial to great solar we can go a full week or more without ever having to on our generator and using our appliances comfortably throughout the day and night. If we are getting partial sun or limited sun (because it’s rainy or overcast), we do have to supplement with our generator every other day. For us it’s a trade off. We did what we could afford and had space for at this time, and while it’s not the perfect set up, it gives us a huge amount of freedom to camp where we want without our generator running constantly. Ultimately we’d love to increase our battery bank using lithium (to save on weight and space overall) while still have higher amp-hours, but we’re big believers in do what you can now and upgrade when the moment is right. Get our exact battery bank here! Lead Acid is the most cost effective, but typically don’t last as long as some of the other battery types. You also have to maintain these pretty regularly (top them off with water for example). The next tier up in terms of cost, is sealed batteries. They are similar to lead acid in terms of capacity and performance, but they don’t have maintenance. AGM is the next price bracket up, and with the higher cost you’ll start to see more benefits. AGM has the ability to deep cycle, and charge up to five times faster than a standard lead acid battery and weighs more or less the same (they are very heavy). The most expensive option for building your battery bank is lithium. Lithium is pretty superior in the world of batteries for a number of reasons. They are lighter, charge faster, holds charge for longer, have a longer life (meaning # of charge cycles), and you can actually use up to 80% of the battery capacity instead of the 50% like with other batteries. At this point, you may be wondering, “how do I monitor my batteries to make sure they don’t drop below the 50% threshold?” Most RV’s, trailers, or fifth wheels, have a “button” that allows you to check your battery levels. This button is supposed to show you the level of charge your batteries are at, or how much juice you have left. We hate to be the bearer of bad news, but that button is crap! It doesn’t give accurate readings, which in turn doesn’t allow you to safely or accurately monitor your battery levels. The good news, you can monitor your batteries more accurately with your charge controller (comes with the solar panel kit), and/or your inverter. While this isn’t a perfect reading of your batteries, it does give you a much more accurate reading than your stock “battery monitor button”. To get a near perfect reading made specifically for your rig, batteries, inverter, and solar panels you’ll want to get a Battery Monitoring Kit (BMK). Read more about BMK’s here. We don’t personally have a BMK yet, and just go off our solar charge controller and inverter readings to monitor our batteries. We like to account for only the usable energy in our battery bank. Since we do not let our batteries go below 50% of total charge (at least we try not to), we consider the 50% mark, “empty” which is around 12.0 volts. We consider fully charged, 13.0 volts. Technically, you can drain your batteries lower than 12.0 volts, but doing so will be detrimental to the health of the battery. 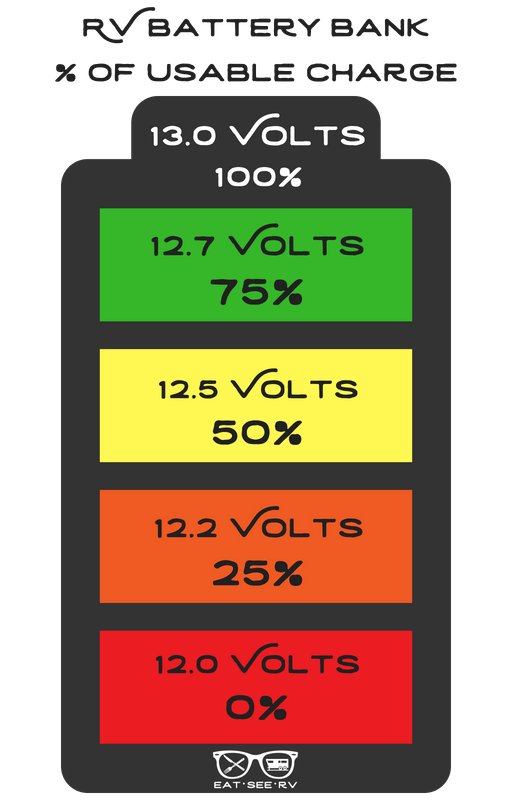 We made this helpful visual chart so you can better understand the usable energy in your battery bank in terms of volts and % of usable charge remaining. Please note, this is a generic chart, and may not accurately reflect your exact set up, batteries, or rig. If you are concerned with the numbers, a BMK might be a good solution for you! What size inverter do I need for my RV? The inverter’s job is to invert the D/C power that is stored in the batteries into usable A/C power (like most of the appliances you want to use on your coach). In order to do that, you need to make sure your inverter can handle the wattage or “load” you are putting on it from each appliance. You don’t want to overwork your inverter, so it’s important to have enough wattage to cover more than your needs. There are two types of inverters, modified sine wave and pure sine wave inverters. To keep it simple in this post, we suggest buying and using only pure sine wave inverters. If you want to know why, click here to be taken to another post. Since you already wrote down the number of watts each appliance uses, you want to look at the highest wattage to determine your inverter size needs. We use “light load” appliances whenever we need, but are careful with our usage of “heavy load items” like coffee maker, blow dryer, microwave, or convection oven. We just can’t blow-dry our hair and make coffee at the same time (we’re okay with that). We made sure the inverter we bought, a 2,000 watt inverter allowed us to use most items on our rig with the exception of our A/C, electric fire place, or washer/dryer combo. If 2,000 watt inverter doesn’t do the job for you, there are a range of sizes to chose from; 1,000 watt, 1,500 watt, 2,000 watt, 2,500 watt, or even 3,000 watt inverters. Obviously the higher the wattage, the higher the cost. If you’re trying to be budget friendly, really think about the size you need (not necessarily want). We’ve never felt we didn’t have enough power with our inverter even though it’s 2,000 watts. The calculator you used earlier will also tell you the ideal amount of panels in terms of watts as well as the right sized solar charge controller. I wish there was any easy formula that said a panel (like a 100 watt panel) would produce x amp-hours of usable power per day, but I can’t. The actual amount of amps a panel produces is largely affected by the latitude your at, the angle of your panel to the sun, the amount of sun produced in the given day (such as cloudy day vs. full sun or the season you are in). We’ve found that our 100 watt panels produces anywhere from 4 to 8 amps per hour a piece (and that’s in partial to full sun). To be safe, you can estimate that a 100 watt panel will give you around 25 – 35 amp hours per day. So with 300 watts you would have 90 amp-hours being stored in your batteries. With 500 watts, you’d have 150 amp hours per day! We have 420 watts of solar with our Renogy 300 watt solar roof kit and our 120 watt Go-Power Portable Solar Panels, which gives us around 110 – 130 amp-hours per day. That is more than enough to keep our batteries topped off and well above the 50% mark even into the dark. If it’s cloudy for a few days in a row, we simply turn our generator on to top our batteries off until the sun comes back and works it’s magic. A big misconception with RV solar is that you need 500, 600, or 900 watts of solar for it to be worth it. Reality is you only need as many panels as your batteries are able to store, and your usage warrants. It doesn’t matter how many panels you have if you don’t have the battery bank to store the energy your panels are pulling in! That’s why we went with the lower amount of panels since many times our batteries are reading as full when we have optimal sun. The system has to work together, and why spend money when you aren’t able to reap the benefits? We suggest investing in your batteries as they are the power house (literally) to the entire RV solar set up. You can always add more panels later if you find you would like more energy to be put into your battery bank. Our 300 Watt Renogy Solar Kit came with a 40amp solar charge controller which more than fit our needs for 300 watts and potentially 400 watts if we really wanted another panel. A 30amp solar charger is more than enough if you have 100 – 300 watts of solar. If you want to go to a 40amp, 50amp or 60amp solar charger because you think you’ll eventually have 400 watts or more of panels then we suggest buying that size the first go around. It’s also important to note there are two different types of solar charge controllers, PWM (Pulse Width Modulation), or MPPT (Maximum Power Point Tracking). MPPT’s are more efficient than PWM, so for that reason we suggest buying an MPPT charge controller if you have the option. We love the Renogy kit’s because they come in a range of solar panel wattage and includes everything (well almost everything) you need for your solar install, including the solar charger. Take a look at some of Renogy’s other Solar Kit’s: 100 Watt Solar Panel, 400 Watt Solar Kit, or this 600 Watt kit! 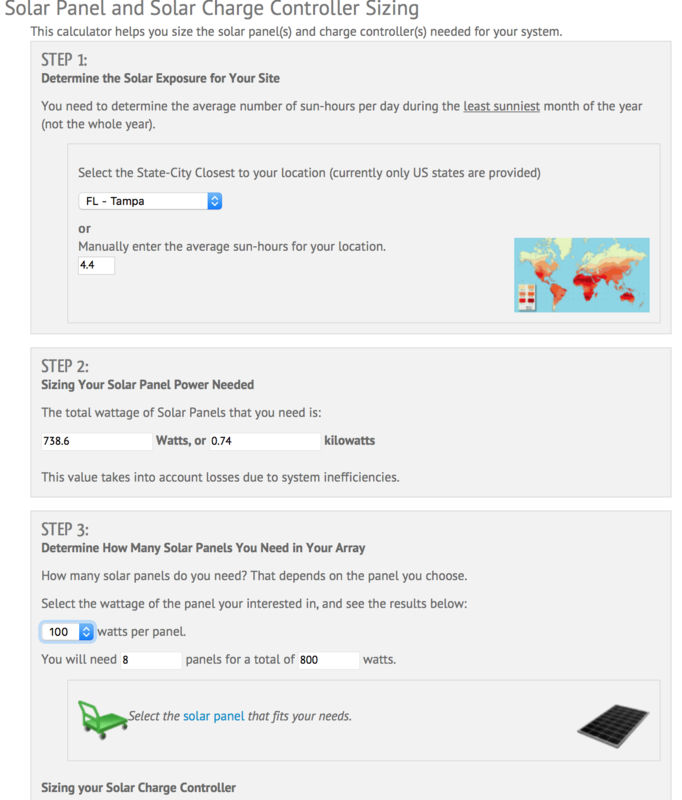 We hope this post helped better explain how to calculate your RV solar needs for your rig and your set up! Everyone’s needs are different and there is no perfect solar set up, although we’ve seen some that are aiming for that title. We’d love to hear if you found this post helpful, what set up you have for your RV solar, or if you have any questions in the comments section below.